If a U.S. military satellite were jammed, the public likely would not hear about it, as such events are classified. 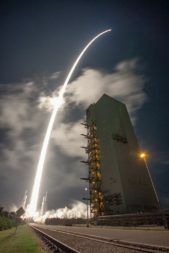 Only one U.S. satellite communications network is said to be completely jam-proof, the Advanced Extremely High Frequency (AEHF) system the Air Force began deploying in 2010 to replace its legacy Milstar satellites. AEHF is a multi-billion-dollar constellation of four satellites projected to grow to six over the next two years. The newest satellite in the constellation, AEHF-4, Oct. 17 from Cape Canaveral Air Force Station, Florida, aboard a United Launch Alliance Atlas 5 rocket. Due to growing cybersecurity concerns, the AEHF system is in high demand across the U.S. military. But the Pentagon reserves AEHF capacity for the most sensitive strategic communications — like nuclear command and control or planning air strikes — and wants to move tactical users to less expensive alternatives. The Defense Department has asked the Air Force to provide another option for tactical users that need jam-resistant satellite communications. The Air Force’s answer to that request is the Protected Anti-Jam Tactical Satcom, or PATS. 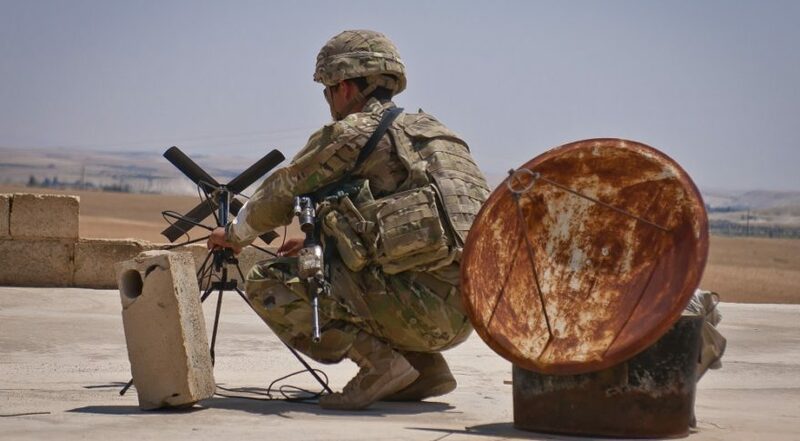 It is envisioned as a more affordable and resilient military satcom system for tactical operations in a contested environment — a term used by the Pentagon, in this case, to describe anywhere U.S. communications systems will face electronic interference. There are three key pieces in the PATS program: User terminals, ground stations and satellites. The project got off to a slow start and so far the only equipment that is in development are the terminals. Two years ago, the Air Force Space and Missile Systems Center awarded three contracts — $39 million to Raytheon, $38 million to L3 and $33 million to Viasat — to develop prototype terminals for field demonstrations that are scheduled to run through 2020. The three companies are producing modems that run a military-developed Protected Tactical Waveform and must demonstrate the ability to provide anti-jam communications to users of the Wideband Global Satcom (WGS) constellation and commercial satcom services. The Air Force has not announced when it plans to select one or more of the three terminal providers to move forward in the program. After the field demonstration comes the next phase, the Protected Tactical Enterprise Services. The PTES focuses on the ground stations that will transmit the Protected Tactical Waveform over WGS and commercial satellites. Both the terminals and ground stations will be designed to be compatible with existing WGS military and commercial satcom systems that the Pentagon uses today. A new satellite eventually will be developed under PATS, but the military in the near term will have added layers of security in legacy systems once the new terminals and PTES ground stations are operational. Industry sources said the Air Force is pressing forward with the PATS program not only to boost the cybersecurity of satellite communications but also because it buys the service time before it has to decide how to replace some of the aging WGS satellites over the next decade. The 10th WGS satellite is scheduled to launch in 2019, and Congress inserted money in the Pentagon’s 2018 budget for WGS 11 and 12. The Air Force for years has been contemplating options to substitute or supplement WGS with commercial services but no decisions have been made. The PATS effort would ensure that legacy systems get extra cybersecurity. The architecture also would allow the military to use commercial networks from different vendors even if those systems don’t talk to each other. By adding a software layer or a modem interface, the system would decide the most optimal network depending on the quality of service available from different systems and the user’s location. Air Force Lt. Gen. John Thompson, commander of the Space and Missile Systems Center, said protected tactical satcom is now one of the service’s “pacesetter” programs that will be put on a faster track. SMC is being reorganized into so-called SMC 2.0. Speaking Oct. 29 at the MILCOM 2018 conference in Los Angeles, Thompson said SMC will use new authorities it received from Congress — from Section 804 of the 2018 National Defense Authorization Act — to accelerate protected tactical satcom programs, Signal Magazine reported. Thompson noted that SMC’s rapid procurement arm, the Space Enterprise Consortium, is using a less bureaucratic contracting method known as Other Transaction Authority in support of PATS and has awarded 13 projects for prototype technologies so far. Thompson did not provide details on the accelerated timeline for PATS. An SMC spokesperson did not respond to questions by press time. Several satellite industry executives contacted by SpaceNews said they could not comment on upcoming PATS competitions due to the sensitivity of the program. According to Air Force briefing charts presented at the Milsatcom USA conference in Arlington, Virginia, this summer, the plan is to award a contract by the end of 2018 or early 2019 for the Protected Tactical Enterprise System and have the ground systems developed by 2023. Lockheed Martin, Northrop Grumman and Boeing are said to be leading industry teams competing for the award. Congress appropriated $46 million in the fiscal year 2019 budget for Protected Tactical Enterprise System. The final piece of PATS will be the satellites, an effort likely to take several years. The Air Force has yet to settle on an acquisition plan for a new constellation of interconnected Protected Tactical Satellites. The satellites are expected to provide onboard waveform processing to increase the amount of anti-jam capability in a contested environment. The overall PATS architecture will be designed so users will have access to the future Protected Tactical Satcom satellites, WGS and commercial networks. A diversity in communications is one way to create resiliency in the face of growing threats, said Brig. Gen. DeAnna Burt, director of operations and communications at Air Force Space Command. “You don’t put all eggs in one basket,” she said at a recent Mitchell Institute event on Capitol Hill. Burt complimented the Space and Missile Systems Center for efforts to improve cybersecurity in satellite communications. “SMC has done a great job putting capabilities in the software to give us more protection,” she said. The likelihood that the Protected Tactical Satcom satellites will be government-designed and -owned raises questions about how the Pentagon plans to acquire satellite communications from the private sector in the future, Cowen-Hirsch said. Congress in the 2019 defense budget set aside $49 million to create a new procurement office for commercial satcom. 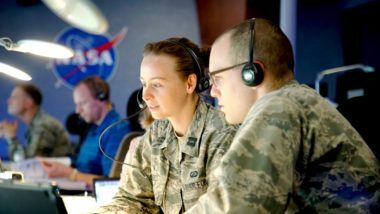 The organization that procures commercial bandwidth for the military was reassigned from the Defense Information Systems Agency to Air Force Space Command. The new office has yet to reveal how it plans to acquire commercial satcom. “It will be interesting to see how Air Force Space Command prioritizes commercial and military satcom in an operational environment so you can have the right effects for the warfighter,” said Cowen-Hirsch. The Air Force, meanwhile, is weighing options to develop a new strategic satellite communications system over the coming decade to replace and supplement AEHF satellites. Col. David Ashley, head of the protected satcom division at the Space and Missile Systems Center, told reporters last month that the manufacturing of AEHF satellites is likely to end after prime contractor Lockheed Martin delivers the sixth one in 2021. A future system, called Evolved Strategic SATCOM, is still in the early planning stages.